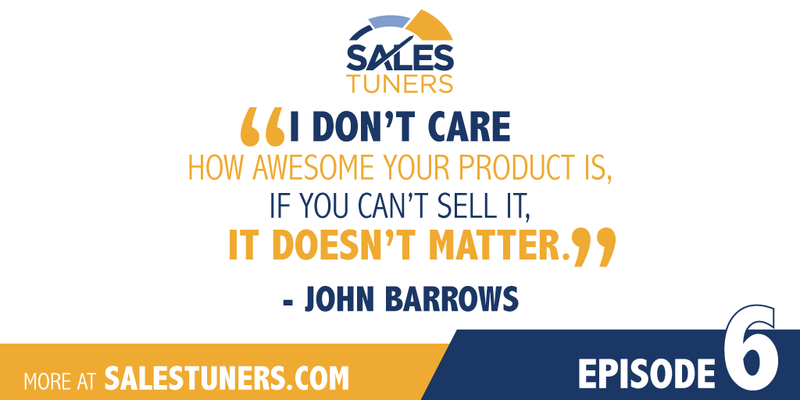 I’m excited for you to meet this week’s guest, John Barrows (@JohnMBarrows), Leading Sales Trainer for Tech Companies. When John is not Snapchatting sales tips and answers, he’s spending time on planes or with his family. His straightforward approach to sales and passion for the solution has made him an in-demand sales trainer for companies like Salesforce, LinkedIn, and Box. His first lesson? Is on prospecting. John has built the process of prospecting into his daily routine. His routine keeps the pipeline full of high-quality opportunities. In his words, the rest of the stuff becomes a lot easier when your pipeline is full. “I want to want your business so that I sell the right way.” If you don’t need the business it becomes unnecessary to discount; the objections are easier to handle and pricing is firm. Further, you have done the upfront work to know whether the prospect is a good fit for your solution. Sales is a brutal profession. In order to combat this inherent characteristic you must be passionate about what you are selling. According to Barrows, it is a thousand times harder if you don’t believe in what you do. Ultimately, the role of a sales rep is to transfer enthusiasm by communicating value, personalizing the approach, and making a difference. If done right, this transfer is what makes sales the greatest profession on the planet. Prospecting: By simply picking up the phone you open up a world of new opportunities. Prospecting helps solves a lot of problems while developing you faster. Time: Time is the most valuable asset any of us have. When reaching out to a prospect be clear on the value by doing research, asking good questions, sharing insights, and testing out different approaches. Goals: Goal setting is one of the most important things any sales rep can do in their career, whether it’s daily weekly, monthly, or annually. The act requires you to ask yourself questions in preparation for prospecting meetings and help you to proactively address objections.